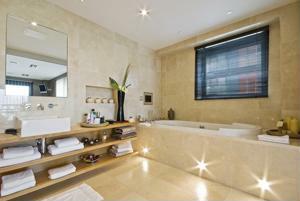 There are many reasons why you would want to renovate your bathroom. It could be because it's simply outdated, and for others, it's the kids pressuring them for a fun space. But for a room that will be used by everyone in the home, you have to put two priorities on top of the list: comfort and luxury. Lesley Taylor, who is the design director at Taylor's Etc., told Wickes that these days, having the right balance of comfort and luxury is integral in the bathroom for a space that can satisfy everyone's needs. She adds that more and more homeowners are opting for opulent bathroom accessories and fixtures that are not only beautiful but also easy to use. For your own luxurious and comfortable space, look for the right bathroom accessories and fixtures that will satisfy not only your eyes but also your comfort level. For your bathroom vanity, for instance, opt for a piece that can serve everyone in the family conveniently and still be a beautiful focal point in the bathroom.